What if we lived in a world where seeking help was considered as noble as offering help? For firefighters, police officers, and emergency medical technicians, helping others is a key duty—one that people hold in high regard, and rightfully so! In life-and-death situations, the giving and the accepting of help by emergency responders are seen as both noble and normal. For example, very few people would think less of apartment dwellers who received help from the fire department to put out a blaze that was not their fault. And yet, it is unfortunate that not all forms of help-seeking behavior are so widely accepted. For instance, people suffering from a mental illness might be stigmatized by others for seeking help or going public with their condition. Fear of stigmatization often prevents individuals from seeking help that would reduce pain and suffering, thus improving quality of life. The benefits of help-seeking behavior do not need to be as dramatic as the examples I offered above. Think about a first-generation college student struggling in a Calculus II course during her first year away from home. Will she seek help from the teaching assistants, the instructor during office hours, after class, or via e-mail? Will she visit the Math Learning Center on campus or will she struggle in her dorm room thinking that she must “go it alone” because that’s what college students do? Does the newly divorced single parent seek out family support and local support groups? Or perhaps because of the difficulty of the divorce or his shame or guilt, does he refuse help even when help is offered from trusted family members without hidden agendas or strings attached? Is seeking help perceived as a sign of strength or a sign of weakness? As Psi Chi President, I formulated a plan to launch a presidential initiative and pitched it to the Psi Chi Board of Directors1 at our June 2017 board meeting at the Psi Chi Central Office. The only reason that I was able to even think big and broad about such an initiative is because Psi Chi, organizationally, is in such good shape.2 Why helping behaviors? Simply because of their universality. We need to encourage people who need help to ask for it. We need to tell the success stories of those who asked for help and received help that made a difference. This latter strategy, communicating that Help Helped Me, shall be the central focus of my presidential initiative. To my knowledge, this is the first time a Psi Chi President has ever had an initiative of this size and scope, so naturally, I needed . . . help. I did not hesitate to ask for help, because (a) I knew I could not do this alone, (b) I knew the outcomes would be better if I had help, and (c) I also knew about the depth and breadth of Psi Chi and its human capital. Working with Psi Chi’s Executive Director Dr. Martha Zlokovich and Director of Membership and Development Cynthia Wilson, we formulated a plan to ask Dr. Nadine Kaslow (Emory University, Grady Memorial Hospital Atlanta; former APA President; former Psi Chi chapter president as an undergraduate; and Chair of this year’s Psi Chi Give Back campaign) to help lead a Summit meeting to brainstorm about how my ideas could truly become an initiative embraced by Psi Chi chapters around the world. 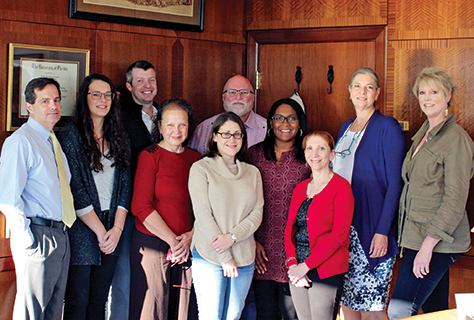 The Summit was held October 25–27, 2017 at the Psi Chi Central Office, and the participants are pictured. Summit participants left to right: Dr. Brian O’Leary (Psychology Department Chair, University of Tennessee at Chattanooga), Maggie Dempsey (Psi Chi Chapter President, University of Tennessee-Chattanooga), Dr. Brandon Rodgers (Director of Behavioral Health, Siskin’s Children’s Hospital), Dr. Nicky Ozbek (psychology faculty member, University of Tennessee at Chattanooga), Dr. Rachel Ammirati (psychiatry and Behavioral Sciences faculty member, Emory University), Dr. R. Eric Landrum (Psi Chi President, Boise State University, ID), Avante Smack (Northwestern University postdoctoral student), Dr. Nadine Kaslow (Psychiatry and Behavioral Sciences Vice-Chair, Emory University; Chief Psychologist, Grady Memorial Hospital), Dr. Martha Zlokovich (Psi Chi Executive Director), and Cynthia Wilson (Psi Chi Director of Membership and Development). Photo credit: Lauren Surmann. The brainstorming that ensued over a day and a half was remarkable, and as the year 2018 unfolds, a number of opportunities will become available for Psi Chi chapters to participate in and adapt to their own interests and needs. The name of this presidential initiative is Help Helped Me. 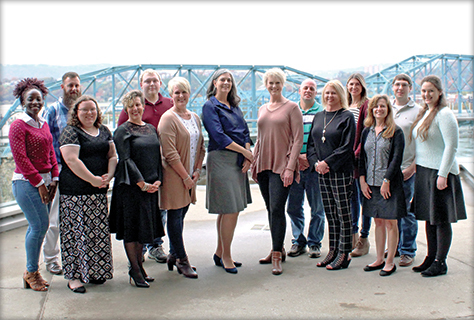 The goal of this presidential initiative is to leverage the multiple strengths of Psi Chi to promote the stories of those who have successfully sought help. By telling help-seeking success stories, we aim to improve health (mental, physical, and academic health) on campuses and in communities. When help-seeking is destigmatized, our hope is that unnecessary human suffering is reduced and individuals are empowered to lead more positive and productive lives. Many portions of this initiative will be powered by the talented individuals who work in our Central Office in Chattanooga. In addition to help from the Central Office staff, my hope is that Summit participants, Board members, faculty advisors, and Psi Chi members will continue to help with the organization and implementation of initiative activities. This will always be opt-in, meaning voluntary participation for chapters and members. Using various chapter activities, the over-arching goal will be to highlight stories of how help has helped individuals—or from the personal perspective, how Help Helped Me. Some of the activities that we are working on for launch in 2018 include a method for volunteers to carefully and thoughtfully acknowledge how someone helped them succeed—acknowledging both the helper and exactly how the help helped. This would be similar to thanking the firefighters for the great job that they did saving the apartment, acknowledging that you could not have put out the fire yourself, but that their help helped. We will encourage chapters to think locally about the needs of their community, and perhaps collect stories about how Help Helped Me in regard to key local issues—domestic violence, sanctuary campus, food insecurity, or racial tensions—with the goal of telling those success stories of how help helped. These are just some of the early ideas that we will be presenting to chapters as we roll out the #Help_HelpedMe social media campaign throughout 2018. It is my high honor to serve as your Psi Chi President. I am thrilled to be able to launch an international initiative that could impact so many lives. Rather than stigmatizing others for seeking help, let’s work together toward a future where seeking help is universally perceived as a psychological strength. Let’s start to celebrate the success stories of those who sought out, accepted, and benefitted from help, just as we celebrate those talented individuals who deliver that help. Of course, to achieve that goal, I will need your help. 1 The Psi Chi Board of Directors is comprised of the six regional Vice-Presidents (Western, Rocky Mountain, Southwestern, Midwestern, Eastern, and Southeastern), the presidential trio (President-Elect, President, and Past-President), and the Executive Director as an ex officio/nonvoting member. After presenting my idea about the initiative to the Board, I stepped out of the room for part of the discussions, and I abstained from voting on the motion concerning my initiative. 2 Although many hands have contributed to that effort, in recent history allow me to specifically acknowledge the great work of Daniel Corts, Jon Grahe, and Martha Zlokovich in strengthening the structures and functions of Psi Chi such that the launch of a presidential initiative was even dreamable. We at Psi Chi believe you should be able to get help when you need it! R. Eric Landrum is a professor of psychology at Boise State University, receiving his PhD in cognitive psychology from Southern Illinois University–Carbondale. His research interests center on the educational conditions that best facilitate student success and the use of SoTL strategies to advance the efforts of scientist-educators. He has over 300 professional presentations at conferences and published over 25 books/book chapters, and has published over 75 professional articles in scholarly, peer-reviewed journals. Eric has worked with over 300 undergraduate research assistants and taught over 13,000 students in 23 years at Boise State. In 2014, APA President Nadine Kaslow presented Eric with an APA Presidential Citation in honor of his work in advancing the teaching of psychology. Eric is the lead author of The Psychology Major: Career Options and Strategies for Success (5th ed., 2013), authored Undergraduate Writing in Psychology: Learning to Tell the Scientific Story (2nd ed., 2012), and Finding A Job With a Psychology Bachelor's Degree: Expert Advice for Launching Your Career (2009). With the launch of a new APA journal in 2015—Scholarship of Teaching and Learning in Psychology—he will serve as one of its inaugural coeditors. Eric served as Vice-President for the Rocky Mountain region of Psi Chi (2009–2011). He is a member of the American Psychological Association, a fellow in APA’s Division Two (Society for the Teaching of Psychology/STP), served as STP secretary (2009–2011), and served as the 2014 STP President. In April 2016, he becomes President of the Rocky Mountain Psychological Association.